The model PG23LT high-quality pressure gauge has been designed specifically for extremely low ambient temperatures down to -70 °C [-94 °F]. 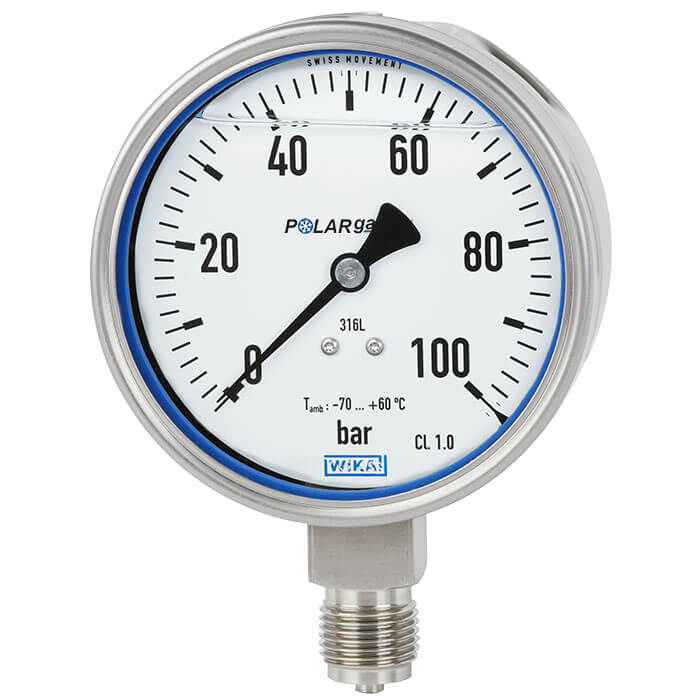 The stainless steel Bourdon tube pressure gauge finds applications in particularly cold regions such as Russia, Canada, Scandinavia or China. The PG23LT is used primarily in the oil and gas industries and in the petrochemical industry. The typical measuring points are located on pipelines or in pumping stations for oil and gas transportation. As a result of the special low-temperature design of the instrument, the use of special seals and the case filling, the model PG23LT is suitable for outdoor applications down to an ambient temperature of -70 °C [-94 °F]. The same instrument design fulfils the requirements for both IP66 and IP67 ingress protection for pressure ranges greater than 0 … 40 bar. The proof of the instrument's suitability for ambient temperatures down to -70 °C [-94 °F] was provided in the in-house laboratory and can optionally be confirmed by a 2.2 test report.